I hope you enjoyed Beltane weekend, whether you celebrated outdoors or in, solo or with others. We’re coming up on the Taurus New Moon (Thursday) and Genevieve Hathaway has written her Moonshine horoscopes available in this edition. I hope you enjoyed Beltane weekend, whether you celebrated outdoors or in, solo or with others. We’re coming up on the Taurus New Moon (Thursday) and Genevieve Hathaway has written a set of Moonshine horoscopes, which you can read here, especially for the occasion. 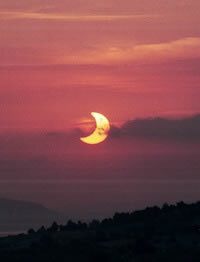 Annular Eclipse at Sunrise. Photo by Anthony Ayiomamitis. This New Moon is also an annular (not annual) solar eclipse in Taurus, flanked by several planets in the sign of the bull (a regular herd). This is the second of two eclipses along the Taurus-Scorpio axis, and in two weeks, we’ll have a third eclipse on the Gemini-Sagittarius axis. But let’s not get ahead of ourselves — this week is rather special. In Monday’s Daily Astrology post on the Planet Waves blog, Eric discussed Thursday’s eclipse in the context of Beltane season. He’ll be taking his last look at this New Moon eclipse in tonight’s broadcast of Planet Waves FM, which usually posts by 8 pm EDT (often earlier). Eric will also investigate the astrology of the three abducted women finally rescued from the house where they had been kept by three brothers in Cleveland for about 10 years. Today’s Daily Astrology post asks you to consider Mercury’s message as it conjoins Mars in Taurus and aspects two other planets. We’re entering a rare opening for conscious and progressive decision-making, a hot-spot of energy on the way to the eclipse vortex. At around noon EDT today Len Wallick offers his take on Venus entering Gemini Thursday morning, another landmark on our way to the eclipse. Finally, if you are a Taurus (by Sun, Moon or rising sign) or know a Taurus, there has never been a better year to treat yourself or a loved one to the Taurus Birthday Reading Eric has recorded. This is your moment, bulls.